Hello everyone and welcome to another Create with Connie and Mary Thursday Challenge and this week we have a GREAT sketch for you! We have having a quite a ‘winter’ here and I WANT IT TO BE OVER!!!! So…so help it along some…I decided flowers were in order! I absolutely LOVE the Sweet Sorbet SAB dsp…it is just so PRETTY!!! When I was looking at the sketch and trying to figure out what to do I say this paper just sitting there saying…’pick me!!! pick me!! !’…so I did! Whisper White 2 3/4 x 2 3/4. Stamp leafy image from Petal Parade using Pistachio Pudding and small flower using Crisp Cantaloupe then the greeting from Peachy Keen using Basic Black. Layer onto Pool Party 2 7/8 x 2 7/8 and add to card front using dimensionals. Banner is Pistachio Pudding print 7/8 x 1 3/4. Flag is Crisp Cantaloup print 3/4 x 1 5/8. Add flag using dimensionals. Punch out Basic Black Flower (smallest) from the Boho Blossom punch. Take a piece of the Summer Starfruit Twine (Sweet Sorbet Accessory pack SAB), fray the edges, add behind the flower then add to the flag. Add Pool Party Candy Dot to the center of the flower to finish it off. I just LOVE the pretty soft colors on this. And you will LOVE what the rest of the design team did with this sketch so check it out! 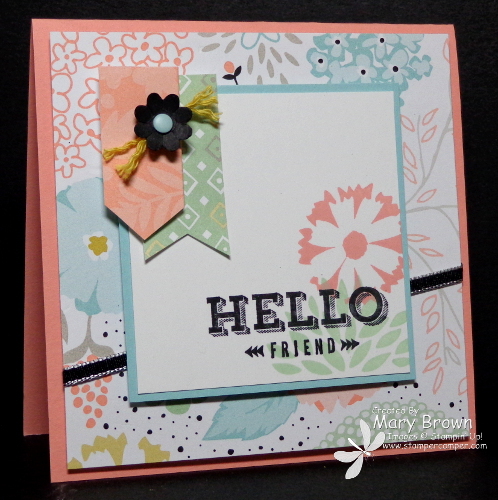 And speaking of Design Teams…the Create with Connie and Mary Spring Collection 2014 Design Team has been busy this past week designing cards! Each member of the team has taken a set from the Occasions Mini and did a minimum of 4 unique cards! It is NOT too late to join and get GREAT ideas for products from the Occasions Mini and Sale-a-bration Brochure. 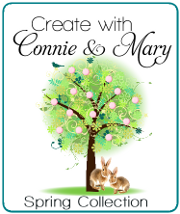 You can still check out Preview Week where you can get a taste of what Create with Connie and Mary Collections are all about! This entry was posted in Create with Connie and Mary, Sale-a-bration, Spring Mini and tagged Peachy Keen, Petal Parade. Bookmark the permalink. Love the soft colors of this! And that bit of twine under the flower is perfect! Beautiful!! Such a nice springy card. I’m so ready for flowers too! Love this card Mary! It uses my favourite sheet of Sweet Sorbet paper and is perfect paired with Petal Parade – it’s all so fresh. Hope you feel warmer soon! Maybe if we all make beautiful cards like this with soft Spring colors, SPRING WILL COME! Wishful thinking??? Fantastic card! I wish it would bring spring here with it! I just love these colors together and the Petal Parade set is quickly being a favorite set!